This is the latest edition of our classic COBOL book. Since the first edition was published in 1979, this book has been used by IBM for both customer and employee training, by hundreds of companies for training, by more than 200 colleges for courses, and by many thousands of programmers for self-instruction and on-the-job reference. To a large extent, this book set the standards that are used for structured design and coding in enterprise COBOL shops throughout the world. Although this book was published in 2004, it still presents the core skills you need for getting a job in a mainframe shop. Because maintaining old ("legacy") programs accounts for 70% or more of the programming done in those shops, this book includes a chapter on how to become an effective maintenance programmer. If you are programming on the IBM mainframe platform, or intend to be, this is a title you should have on your desk. It is the COBOL reference for on-the-job programmers." This book is designed for anyone who wants to learn how to develop structured COBOL programs for IBM mainframes. It works if you have no programming experience. It works if you've developed programs with another language like Java, C#, or Visual Basic. And it works if you've developed COBOL programs on a PC, but you've never learned COBOL at the professional level that's needed on a mainframe. Today, most companies don't use COBOL for developing new applications. That's why it is often called a "dying language." However, there is still a large backlog of "legacy" COBOL programs that are running on mainframes. Those programs need to be maintained. And this is the only book that shows you the techniques that were used to develop those programs. In summary, then, this is the right book for anyone who needs to use structured COBOL on a mainframe. That includes maintenance programmers who need to maintain legacy COBOL programs. That also includes new application developers who need to interface with legacy COBOL programs. In chapters 1, 2, and 3, you’ll learn how to code and test simple programs that prepare reports. In chapters 4 and 5, you’ll learn how to design, code, and test more complicated programs using the best structured programming techniques. In chapter 6, you’ll learn the mainframe skills that you need for working with data. In this section, you’ll learn how to work with intrinsic functions, dates, characters, tables, copy members, and subprograms. You can read these chapters in sequence or in any order you prefer. If you’re using this book on the job, this means it’s easy to learn new skills whenever you need them. In this section, you’ll learn how to work with the three types of COBOL file organizations: sequential, indexed, and relative. Because file processing (not database processing) is a major feature of many mainframe programs, these are essential skills for COBOL programmers. In chapters 4 and 5, you'll learn the structured programming methods that have been used in the best mainframe shops. Paul Noll, a COBOL trainer and consultant, pioneered these methods way back in the mid-1970s. They became an ad hoc standard in many mainframe shops by the mid-1980s. And they've been making life easier for COBOL programmers ever since. Besides teaching standard COBOL, which can be run on any computer system, ours is the only book that shows you how to work in the IBM mainframe environment. And that's where almost all of the COBOL code today is running. 14 full programs and dozens of coding segments illustrate best coding practices. Whether you're a beginner or a professional, you'll boost your productivity by using these as models when you create or maintain COBOL programs. 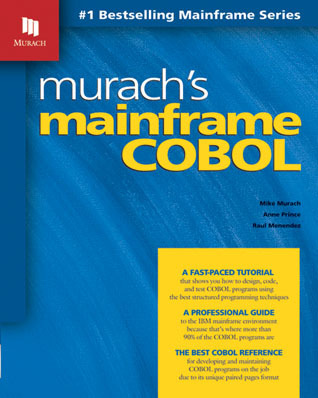 Since this book teaches mainframe COBOL, it is designed for use with an IBM mainframe. That means that it is best used in a training program or environment that gives you free access to an IBM mainframe. Then, you can compile and test your programs on that mainframe. If you don’t have access to an IBM mainframe, you can still use this book to learn how to write COBOL programs. You just won’t be able to practice what you’ve learned until you’re on the job. This book presents the background skills that every programmer needs for working with an IBM mainframe. That includes using the operating system's JCL (Job Control Language), working with VSAM files by using AMS (Access Method Services), and much more. This book shows you how to develop interactive COBOL programs on an IBM mainframe by using CICS (Customer Information Control System). Today, legacy CICS applications are still widely-used by government and financial institutions. DB2 is IBM's database management system, and this two-part series shows how to develop COBOL programs that use DB2. Part 1 presents the basic skills that all DB2 programmers need. Part 2 presents the advanced skills that are associated with a senior programmer or programmer/analyst. This chapter is designed to get you going fast with COBOL. As a result, it gives you some required background, then takes you through two sample programs, so you can see all the pieces that are involved. At the end of this chapter, you should understand how the code in these programs works and be able to code simple interactive programs of your own. This file contains (1) a student workbook in PDF format with learning aids like chapter objectives, summary points, and projects, and (2) the files you need to do the projects. Although these materials are designed primarily for students or trainees who are using this book for a class, they can also be used for self-study. This download contains the files for the data and programs in the book. The programs include report-preparation programs, file update and maintenance programs, and query programs that are typical of the types of programs you'll develop every day on the job. This download also contains a Readme document that summarizes what programs are included and how they relate to the chapters in the book. On this page, we'll be posting answers to the questions that come up most often about this book. So if you have any questions that you haven't found answered here at our site, please e-mail us. Thanks! There are no book corrections that we know of at this time. But if you find any, please email us, and we'll post any corrections that affect the technical accuracy of the book here. Thank you!